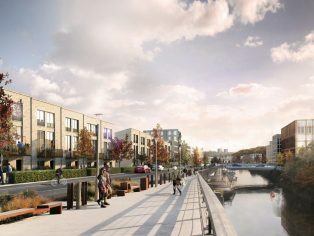 Leeds City Council has resolved to grant planning permission for CEG’s reserved matters (detailed) planning application for the first phase of 112 new family homes and 23,000 sq ft of retail, leisure and community space set around a vibrant public square at the £400million Kirkstall Forge development. Designed by Stirling prize award-winning Feilden Clegg Bradley Studios, these contemporary homes are of a unique design, designed to resemble the local stone of the old forge building and Kirkstall Abbey. The unique architect-designed homes offer a selection of gardens and terraces on different floors, with private roof terraces for the apartments, this maximises the opportunity the sloping site offers for views of the woodland, waterside and across the valley. Some of the larger family homes will also benefit from the historic Mill Race flowing through the end of the garden. The inspiration is taken from the heritage of the site and its woodland setting as well as from ‘model villages’ such as Saltaire and the steep terraced streets found in many Yorkshire towns. 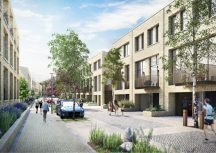 The communal, pedestrian-friendly areas in front of the homes also benefits from contemporary Scandinavian ideas about co-housing and will help to build a true sense of community amongst those who are lucky enough to be the first to move into this pioneering new neighbourhood. Predominently family homes, with some apartments, this first phase is the beginning of a new village connected to Leeds City Centre in just six minutes by the site’s new railway station. The range of homes all make the most of the surrounding landscape are key to building a new future and a new community for this area, with its rich history. Developer CEG is leading the development of the 57 acre Kirkstall Forge site and has already managed more than £40million of investment into clearance, decontamination and infrastructure. Following the successful opening of the new railway station connecting the site to Leeds’ in minutes, the first phase of commercial development completes in the next few weeks, delivering number One Kirkstall Forge, an 110,000 ft², seven-storey Grade A office building, which is already almost 70% let and will become home to hundreds of staff before the end of the year. Ultimately the site will become a thriving mixed-use community, comprising 1,050 new homes, 300,000 ft² of offices and 100,000 ft² of retail, leisure and community space. Once complete, more than 10,000 people will live, work and visit the site.